Thin Ice by Irene Hannon, a Mysterious Review. Review: Lance McGregor was a Delta Force operator turned FBI agent in St. Louis, MO. His first case out of the academy involves Christy Reed, a woman who is still suffering from two disasters: her parents were killed in an automobile accident just six months ago and her younger sister, Cindy, died in a fire which burnt her home to the ground just four months later. Now Christy has received a letter, the envelope addressed to her in her dead sister's handwriting. The letter itself was made up of block letters telling her Cindy has been kidnapped. 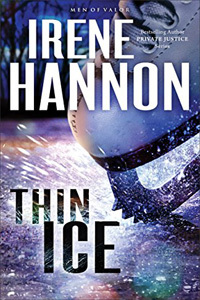 Someone wants Christy to believe that her sister is still alive, and if Christy wants to see her again she must not call the local police, in Thin Ice, the second novel in this series by Irene Hannon. But Christy has to call someone, and she gets in touch with the FBI, who assigns Lance to her case. In the event that someone has her under surveillance, Lance wears casual clothes to their first meeting, greeting her like an old friend. Christy tells him that an autopsy was never performed on Cindy's remains as there was every indication it was she who had died in the fire. Lance gets the body exhumed and tested, and sure enough it is not Cindy, but someone later identified as a call girl. Could it be that Cindy is still alive? And if so, where had she been these past two months? The family has no money to speak of, but then again, the kidnapper — if that is, indeed, who has Cindy — didn't demand a ransom. Lance enlists the help of another agent, and uses his Delta Force training to hone in on some answers. But the truth remains elusive. Thin Ice is an exciting mystery, a combination of whodunit and whydunit, that will keep the reader guessing the entire time. The relationship between Christy and Lance is handled well, as it's clear they have a mutual attraction. Yet Christy is concerned for her sister and Lance is concerned that whoever sent the letter may try something more threatening next. The resolution to the case is well-thought out, and will have readers second-guessing where they thought the story was heading. A strong entry in this romantic suspense trilogy featuring three brothers from different branches of the service. Special thanks to guest reviewer Betty of The Betz Review for contributing her review of Thin Ice. Acknowledgment: Revell Books provided a copy of Thin Ice for this review.